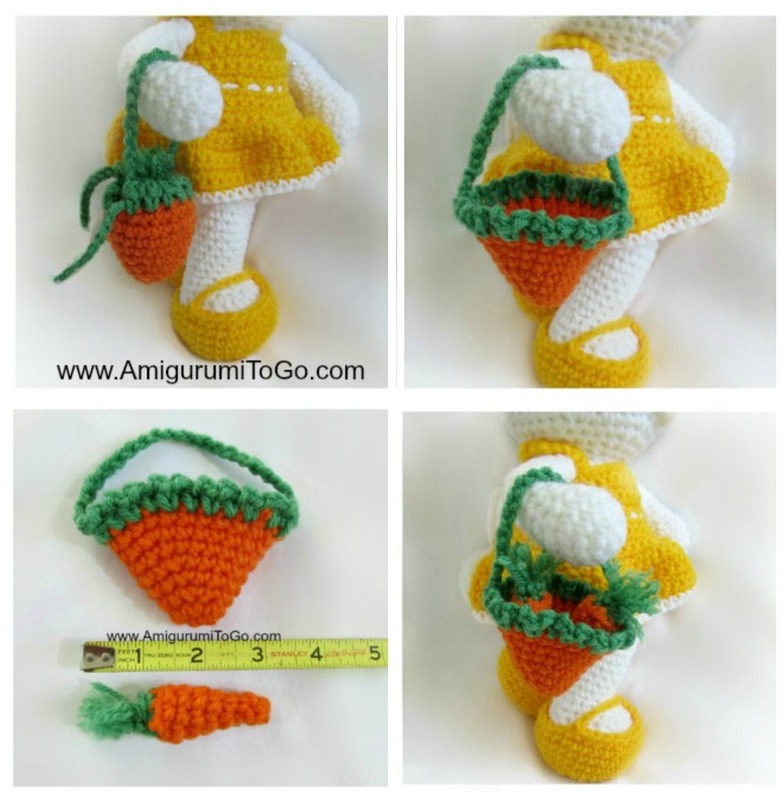 I designed this purse for the Dress Me Bunny but you can use this purse and carrots to go with other bunny patterns as well. 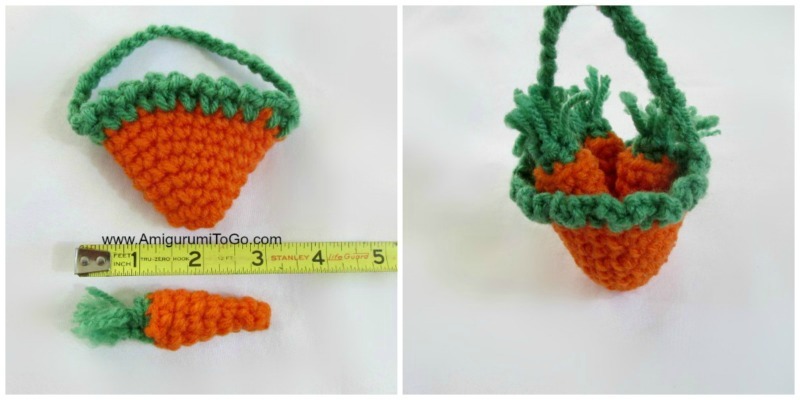 There is also a Basket of Carrots pattern available here. move that marker at the end of every row. Read the rows the same way I explain how to read them in the Bunny pattern. 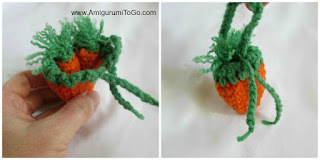 Root about 4 strands of green yarn through the carrot top. Cut to desired length. Split all the strands or leave them as they are. 10) ch23 and sl st directly across into any exposed st. f/o and weave in yarn tail. ch38 and f/o leaving a bit of a yarn tail for weaving. Weave this chain in and out through row 9 then cut the yarn tails free leaving just a bit of length so that the chain does not eventually unravel. You can also add a bit of glue to the end knots if you're worried but it's not totally necessary. Put in 2 carrots and cinch up the chain to close the purse. The carrot tops should be sticking out making the purse look like one big carrot. I think the purse looks great open or closed so you decide if you want to add in that chain or not. And you're done. I hope you enjoyed this pattern. If you'd like to show off the purse you can post pictures on my facebook page, I'd love to see! And thanks for the patterns, they are awesome!!! I just started crocheting again and love your patterns. 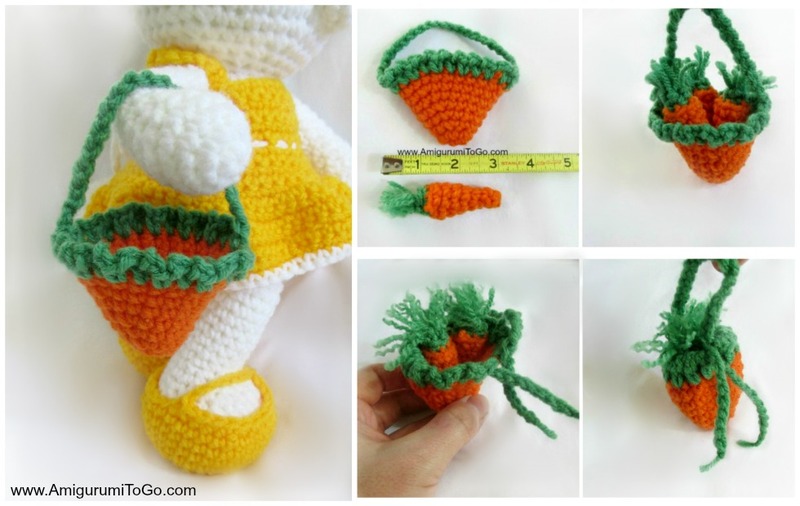 I'm currently trying to make the carrot outfit for my grand daughter and am having trouble with the purse pattern. On row 3 it says 1sc then 3sc in the next stitch and that row should come out to 15 stitches but every time I do it I always get 24 stitches. I know that the previous row is correct. I am alternating the 1sc then 3sc like you have said to do before. Could you please tell me what I am doing wrong? Am I misunderstanding your instructions? Please help?? Thank you so much. I'll post pictures to your facebook page when I'm done. It's perfectly adorable! This pattern is so cute!!!! I have to make my bunny one!! !